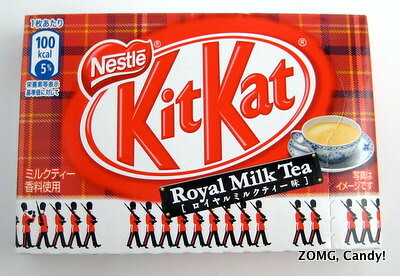 Japanese Kit Kat: Royal Milk Tea Flavor! I got a bunch of Japanese Kit Kats in my free sample box from Tsunami.hk. For some reason, Kit Kats in Japan have taken on a life on their own, with dozens of always available and seasonal/limited edition flavors, some of which are quite weird. Today’s review is of the first of the lot: Kit Kat Royal Milk Tea (ginger ale, 2 kinds of matcha, and raspberry cheesecake were the other ones Tsunami.hk sent). I liked this Kit Kat’s outer packaging, with its plaid background and depiction of the iconic Queen’s Guards. The box held two individually packaged pairs of fingers. Their packaging was blue with a single guard’s silhouette. I wasn’t quite sure what to expect for the flavor. Does the “royal” apply to the milk or to the tea? I guessed that it would be a tea-flavored take on a cafe latte/cafe au lait. 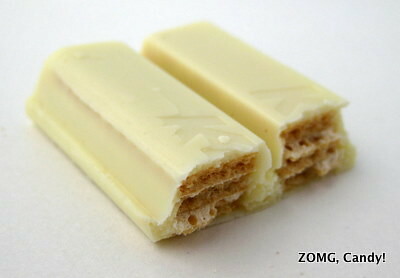 The fingers were white chocolate with the usual Kit Kat cookie wafers. They tasted of vanilla and fresh milk, with a strong creaminess at the finish. There was a bit of fragrant floral-ness mixed in with all that lovely dairy-ness, which made me think that they were aiming for Earl Grey for the tea component. I loved the complexity of the flavors, but it was a tad too sweet for my taste. An O.
Japanese Kit Kat – Ginger Ale Flavor!